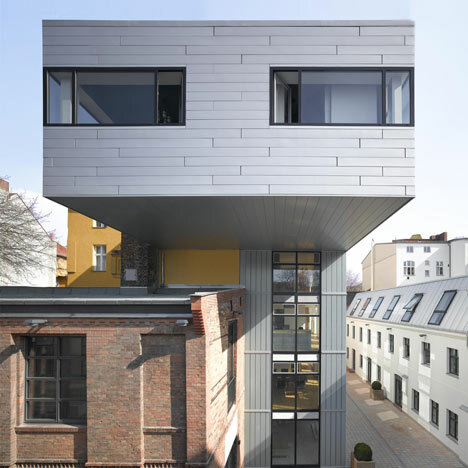 These photographs by Roland Halbe show a mixed-use building by German architects NPS Tchoban Voss, which cantilevers over a neighbouring rooftop in Berlin. The five-storey building is clad in metal panels and contains a ground-floor gallery, two floors of offices and a split-level apartment. The new block completes the Hamburger Hof complex, for which the architects also renovated and extended surrounding buildings. Extensions to existing buildings are also finished in metal panels. The group of buildings surround a courtyard that previously housed a carpenter's workshop. The Hamburger Hof complex presents itself today as a terrain genuinely grown and constantly re-combined by means of residential and commercial buildings over the last 200 year. First documented in 1828, the front building was complemented over and over by additions on the courtyard side, establishing both small trade businesses as well as places of entertainment such as a bowling house. A bronze casting house, a coffee roastery, a brewery, locksmith and carpentry workshops, and various restaurants and bars were located here during the last two centuries, an addition to residential and small office units. The client was fond of the idea to continue this mix of crafts, culture and housing when he acquired the property with the heterogeneous existing development in 2006. In close collaboration with the alert preservation authorities a renovation and expansion concept was developed solely removing two small sheds from the 1960's. Generously glazed attics were sensibly added, partly resuming again the droop volume of the roofs that had been destroyed during World War II. The only completely new building within the ensemble is a five-story construction abutting an existing fire wall. On the top floor it protrudes widely into the retral adjacent park, while at the corner of the neighboring brick house shifting onto the old coffee roastery in respectful distance. New fenestrations on the upper floors of the complex offer spectacular views onto this "pocket park" and the surrounding houses, while the historic courtyard is recast by the new layout explicitly implementing modern materials and shapes and yet retaining its vintage character as a semi-private space.